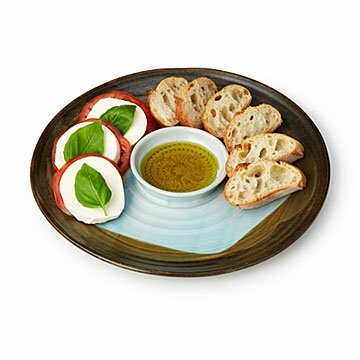 The cleverly integrated design of this handmade platter lets you serve bread and olive oil with one piece. The cleverly integrated design of this handmade platter lets you serve bread and olive oil or dip with one piece. The textured spiral of the central dish is made for grating fresh garlic to infuse your dipping oil with flavor. Master potter Tony Holman hand throws the stoneware platter on his wheel, then forms the smaller dish from extra clay in the center. Robin's egg blue and mossy green glazes add an organic dimension to this distinctive design. Handmade in Plano, Texas. My niece is an entertainer with a new home. This was perfect for her new kitchen! This is a beautiful plate! The size & craftsmanship is awesome. The colors are my favorite. I love it. She used for a Holiday get together and a simple supper with family and friends. It garnered many compliments ! He loves it! Colors are great. Focal point of his party.